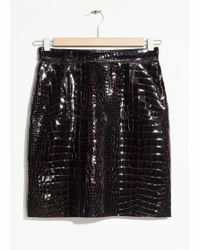 A classic piece that can be dressed up or down, evoke an edgy and rebellious vibe or a sleek and contemporary answer to office wear, a leather skirt is becoming a must-own piece for the modern. Team a skater skirt with a chiffon blouse for an ultra feminine look that exudes sophistication, or dress down a leather mini with a graphic print T-shirt for that effortless, 'model off duty' cool. Phillip Lim is a reference point here for a polished, cutting edge style with his minimalist pieces or try H&M for a faux-leather alternative.